The sixth hole is an uphill par 3 over the creek. A deep bunker on the left and a hazard on the right make club selection on this hole paramount. *ID required to rent a soccer ball for FootGolf round. ID returned at round’s end. FootGolf times may be made up to 7 days in advance. When you call to make your reservation, our staff will ask the number of players in your group and the day and time you would like to play. We will do our best to accommodate you. We will require a phone number, and on weekends, a credit card number to reserve the time. Cancellations will be accepted up to 24 hours prior to your tee time. Please call in advance if your group size changes. 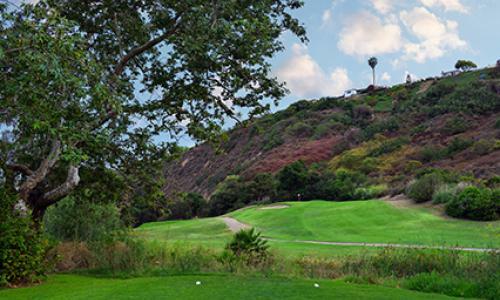 Tecolote Canyon Golf Course is the only golf course in San Diego designed by Robert Trent Jones, Sr. and Sam Snead, and its corresponding AFGL-accredited FootGolf course follows the design aspects of these two golf greats beautifully. From hazards on almost every hole, to beautifully maintained grounds and fairways, if you want to experience FootGolf on a top-rated San Diego golf course, then Tecolote Canyon is an ideal choice. Tecolote Canyon is an 18-hole FootGolf course that costs $15 to walk 18 holes. Remember, a round of FootGolf plays quicker than a round of golf—an average 18-hole round can be concluded in two to two and a half hours. FootGolf times begin at noon. What is FootGolf? FootGolf is an incredibly addictive new sport that combines soccer and golf into a soccer-golf hybrid played with a soccer ball on a course almost identical to a golf course. Instead of clubs, you kick it! Soccer balls for the Tecolote Canyon FootGolf course are available to rent at the Pro Shop for $5, or you may bring your own, as long as it's a standard size, #5 soccer ball. Indoor turf shoes or tennis shoes are suggested. Soccer cleats are not permitted on the course. For more information on how to dress like a FootGolf player (and other helpful tips), head here. You can book tee times online by visiting GoFootGolf.com, or you can call us at (858) 279-1600. New to FootGolf? Read our First-Timer's Guide to FootGolf by clicking here. Read all our blogs on the sport here.